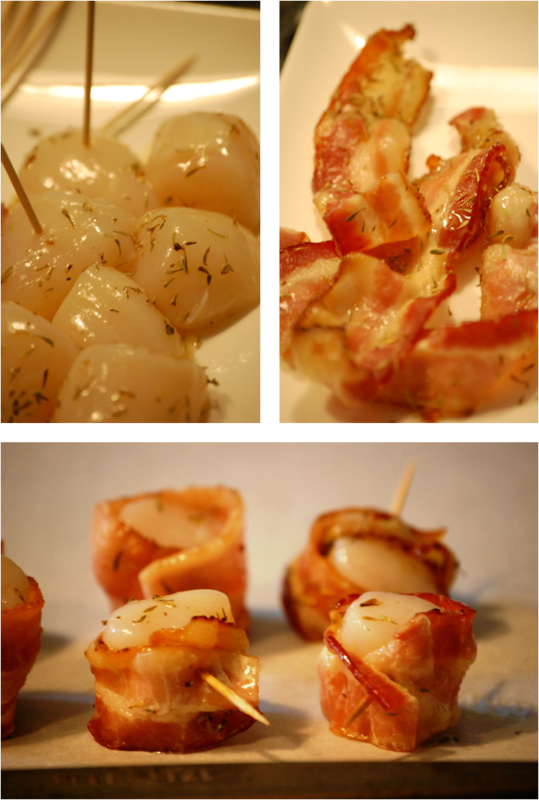 The Cooking Blog of Emilie French Chef: Bacon wrapped Sea Scallops with Salad ... a delicious starter in 30 mn ! 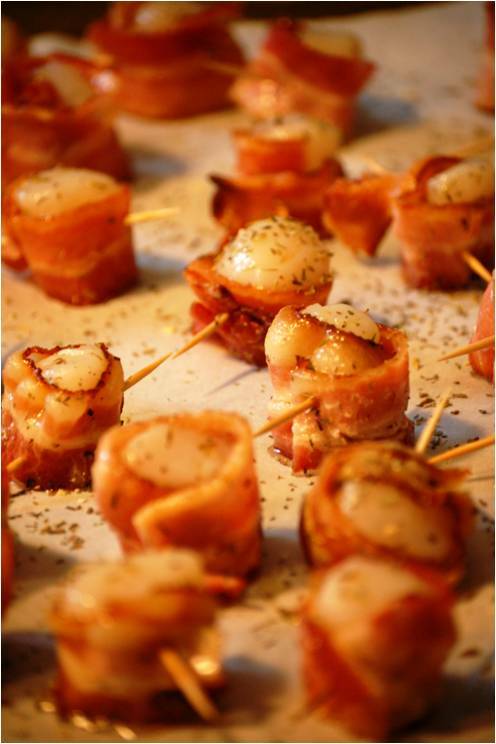 Bacon wrapped Sea Scallops with Salad ... a delicious starter in 30 mn !
" Hi Emilie, how are you ? - What are you doing tonight ? - Nothing ? What ? You invite us for a relax dinner at your house ? Of course we would love to join you !!! We will be to your place in 1 hour !! See you then, merci !" I am sure you know these kinds of last minute dinners !! Perfect, I love having friends at home for dinner and I love challenge, but what can I cook for them in less than 1h ?? Let think about it 5 seconds : it is Summer, I want a light starter, I want to use fresh ingredients and I love Salads. What about "une Salade de Noix Saint Jacques au Bacon croustillant " ? (a Salad with Sea Scallops wrapped in crispy Bacon) - That is just a DELICIOUS idea ! You start grilling your Bacon in the oven, you wrapped your Scallops, you put everything in the oven for 10mn ... you check every 5mn to make it is not browning to fast ... Et voila !!! Olive Oil & Balsamic Dressing (made with 1/3 of Balsamic for 2/3 of Olive Oil) and that's it !! You just have to dress the plates and say "Bon Appetit" !!!!!!!! Place the slices of bacon on a cookie sheet covered with parchment paper. Start the broiler (on low) and brown the bacon until it starts to be crispy and gold. Brush the skewers with olive oil, and sprinkle salt, pepper and thyme. Prepare the dressing with 1 spoon of balsamic, 2 spoons of olive oil, salt, pepper and thyme (you can add chopped shallots). Cook the skewers 8 to 10 minutes on under broiler, turning after 5mn. When the scallops have a beautiful color and the bacon is crispy, remove from the oven. Dress you plates with salad, dressing, and put the scallops on the top. Enjoy with a French Baguette ! Et voila, bon Appetit !! C'est magnifique ! Et vos photos sont superbe. Bonne continuation. Welcome to my new French Cooking Blog !